What Do you Mean by Dumbing Down the Resume? Have you repeatedly heard your recruiter say that you are over qualified for the post they are offering? Have you ever experienced rejection at an interview because you knew more than needed? Have you ever been disqualified from an interview due to your experience and past job history (mentioned in the resume)? Well, then that is your queue to cut short some details from your resume. Resume contain all the details of your qualification, advanced degrees, your strengths, achievements, etc. However, there are times when you require cutting short on your assets in order to land a job that requires lesser qualifications. Often people tell the interviewees to make sure that other candidates do not make you feel intimidated. Well, they indirectly tell you that sometimes you need to be good, and not the best. So dumbing down resume sometimes will be helpful. How to Dumb Down your Resume? People everywhere talk about dumbing down their resume to get a job that requires lesser qualifications. Moreover, dumbing down has many negative effects on your esteem and confidence. However, if you aim to get a short-term job you might as well try it. So how would you dumb down your resume? Well, check out some suggestions that might help you. Some less qualification jobs have a comparatively lesser job description. For example, the job description of a data entry person will have nothing more than computer skills, MS Excel, etc. Thus, there is no need to write a descriptive essay in the summary. Make your summary as bland as the job description. However, make sure that your summary is simple and appropriate. What does a resume talk about you? A resume is an in-depth history, geography, and chemistry of your career and life. As a result, it will contain innumerable information about your history, geography, and chemistry. However, play smart and eliminate unwanted storyline from your resume. Stick to the point with the help of bullet points. This will not only highlight the bullet points but also keep the tone of your resume down. Achievements tell you about the amazing qualities of the person (here: interviewee). One is by default proud of his or her accomplishments. As a result, out of habit, people tend to mention all the achieved milestones. However, one should refrain from putting achievements at all. Rather than giving the reference of what you have achieved tell them about the present or past duties and responsibilities. Let them know about duties in brief and keep aside the accomplishments. This will indeed keep you from being disqualified from the race. Do not get me wrong. Of course, it is your resume and it must have what is necessary for the job. However, you should make sure that you tame or soften the qualities that you have mentioned. You do not want to come off as a brilliant person. The amount of brilliance may scare them off. The tone of your content should be parallel to the job description i.e. as bland as the summary. Toning down or dumbing down the quality of your resume may come off with various benefits if applied for a short term. One cannot deny that anything that we do have their own pros and cons. Regardless of the advantages and disadvantages one must choose the correct thing. Toning down your unconventional excellence in certain sector may land you in a temporary perfect job. However, you should be clearly acquainted to the benefits and pitfalls of this technique. Let us check out the advantages and drawbacks of the technique. The advantage of a certain thing is the main reason behind trying it. If at all, the benefits outnumber the drawbacks, immediately people opt for the technique. Dumbing down resume is one of the commonly used techniques by innumerable people. This is a boon for those who are unable to fulfill the basic need of food due to the recurring failure at the interviews. However, dumbing down your resume may actually bring you a breath of relief. This may be a temporary relief but it is enough to keep you going for some time. 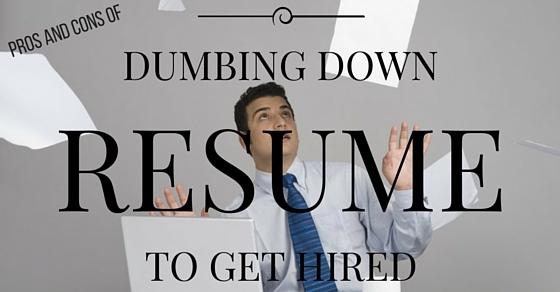 Let us take a glimpse at the pros of resume dumbing. Of course, the freedom of option solely depends upon your choice. On a similar note, when you dumb down your resume to land in a job, by default your odds for landing the job increases. If at all, you plan on working until you receive a knock of the destiny with better opportunities, then for a short period dumbing down to earn the bread works fine. Moreover, the employers rarely prefer overqualified people, as they find it risky to hire them. However, dumbing down resume comes out to be a solution. Yes, it is true that something is better than nothing. On the same note, when you have no other way of earning and rejection seems to knock repeatedly, you need a way of earning. At such a period, you require to tone down your resume and ability. Decreasing the intensity of your resume can guarantee a job. This job can feed you until you get lucky enough in the career department. Thus, dumbing down may not be as bad as you think. Yes, dumbing down your resume may become a huge burden somewhere in the future. Preparing a resume is an age-old method, which is used to ensure a job. However, people who were unable to land in their dream job successfully started to dumb down their work experience and educational qualifications to gain a job that may at least provide food. However, it has various drawbacks that you may want to look at before trying this technique. In the greed of a bread-providing job, some job seekers opt for dumbing down their qualifications. Those who have worked at several places earlier may usually face this problem. With the innumerable availability of contacts and references, it is hardly possible to hide or eliminate certain degrees. Employers may take hardly few minutes to confirm your details through social media and the contacts of the firms you have earlier worked. As a result, you come off as a dishonest person. Moreover, it may directly affect your selection process. Would you as an employer, like to work with someone who seems dishonest? Of course No, you would rather go for someone who promises honest transparency .ie both in work and real life. However, when you dumb down your profile to get in a job, you indirectly increase the odds of you being fired in near future (if at all you land in that job successfully). If at all your dishonest representation is caught, you might land in trouble. Moreover, this dishonest reputation may be hard to explain in the future at different firms. Dumbing down resume means that you are dumbing down your value. It indirectly seems like you are apologizing for what you are. If at all you might not be caught in the act, the problem that might arise is dissatisfaction. You might land in a job that gives you bread to eat however, after a certain period your fire or the passion of doing something in your career will die down. It might arise due to the less payment or no mutual minded employees. As a result, dumbing becomes a failure because you are not satisfied. Motivation is the driving force that pushes a person towards striving better. Imagine if you work in an atmosphere, which has nothing that can motivate you. What will happen to your passion for your work? Slowly and gradually, your passion would die down. Similarly, when you opt to work in an atmosphere where there is no one of your interest, gradually you will start losing your focus. Your career would face dire consequences too. This happens when you dumb down your ability and unconventional excellence to land in a low paying job. Dissatisfaction, lack of motivation, no like-minded staff, etc can affect your career growth adversely. The pros and cons of anything have a subjective difference depending upon how you implement it. However, when it comes to dumbing down resume, nowadays it is not an utmost requirement to land a lower job. With increased number of people appearing for various degrees and comparatively development of the technology, employers’ hire overqualified candidates for the position as long as they are goal oriented. Unlike previous years, when employers would be worried about training or hiring a candidate only to let him leave on finding newer opportunities, the market has a cut-to-cut competition. For example, previously the jobs that were offered to the undergraduate candidates, now also accepts job seekers with MBA degrees. Thus, dumbing down resume is not an utmost need. However, the time of need can always change the situation. There are ways in which one can go for the jobs of their dream without any compromise. Look at these tips. Strategies can either make or break your dream. It solely depends on what type of strategy you apply and how efficiently you implement it in your work. Similarly, strategies can help you in reaching the stars. A perfect strategy may also successfully help you in landing your dream job. It promises you your ideal job with no compromise. Let us have a strategic glimpse at the strategies you might want to implement. Why are you trying for a low paying job? How about it if you try to aim for your ideal job with better asset? A resume should be target oriented. Customized resume is one of the important factors, on which you need to focus. They should be above average, specifically unique. It should have an extraordinary target oriented title. It will not only put you in the limelight but also let your employer know about your future goals. One more essential element that you should not forget is a creative summary. Make your resume stand out by these little changes. Dumbing down your resume may have certain (definite) pitfalls. However, there is one efficient way by which you can eliminate the intensity of unnecessary advanced degrees. As long as the eliminated degrees do not hold any relevance with the position that you are applying, you may proceed. It is always advisable to mention a detail of the past 10-15 years in the experience section. If at all you have an experience of the earlier jobs, you can mention the remaining details in brief in the ‘Additional career info‘ section. It is fine if you eliminate certain degrees or specialization in certain areas as long as you have listed them on the applicant form. After all, transparency helps in building the trust, which enables a smooth ‘employer and employee‘ relationship. The smartest move against the possibility of rejection is by defending yourself. Here is when you have to defend yourself through a cover letter. Cover letter generally makes way for the CV, but here you need to use it to list down all the possible concerns of the employer. Using the concerns defend yourself. The best way to sell you is with brevity and clarity. Clearly provide the benefits that you can give to his or her firm. Moreover, be a solution to his concern. Hence, now that you understand that the pros are comparatively lesser than the cons you might want to be a little smarter and step up your game. Go job seekers, all the best for your future.